Our professional tilers know everything about bathroom tiles as they have to deal with them on a day to day basis. These days there are so many different designs made from different materials. this is where our dedicated project managers come in to play. In this article we will try to enlighten you a bit more about the types of bathroom tiles available on the market and what they are most suitable for. Porcelain or ceramic tiles. A commonly used tile for showers or walls conjoining around bath tubs. Porcelain and ceramic tiles are made from a mix of different clay. Firstly they are pressed in to shape. Once done they are fired at high temperatures in a Kiln. Then comes the glazing, this can give some fantastic colors. The sizes, shapes and patterns give an endless choice. You can also customize them by fusing high res digital images on them. Glass tiles. Because of the nature of glass these types of bathroom tiles are best used on walls although they may be used on floors with minimal footfall. On walls they may be used as a focal point such as a mosaic design. They are available in a range of stock colors but if you want to pay a bit more they can come in custom hues. They generally have a bright and elegant look and have the advantage of being impervious to water and stain resistant. Natural stone bathroom tiles. These types of tiles look perfectly at home in both contemporary and rustic bathrooms. They have a naturally imperfect ans slightly rough look to them. One the down side they are not impervious to water. This means they require a waterproof membrane to be applied. This will protect them from the moisture and water that you find in your bathroom. Marble. Possibly the most natural having been created millions of years ago by limestone that has been crushed and heated by the earth. 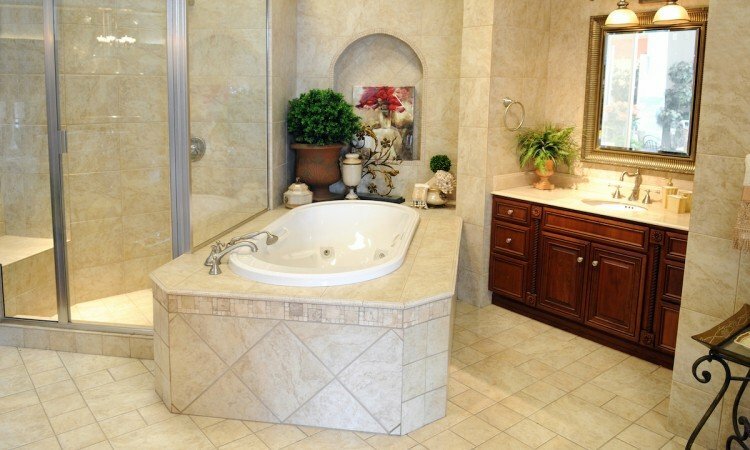 This type of bathroom tile looks traditional and sophisticated. Marble tiles can come in veined and patterned forms with different shades of coloring. This can add an interesting look to a bathroom. Marble tiles come in an array of sizes and usually have a highly polished finish. Granite tiles. Granite is a good choice for counter tops or floors with heavy foot fall. It comes in a wide of textures and colors and is highly durable. A cheaper alternative to Marble. Limestone bathroom tiles. Most commonly found in beige, yellow and brown colors Limestone is a natural stone. It is widely used for floors and counter tops. Metal tiles. You will usually find that metal tiles are used as accents along with other types of tiles in bathroom designs. They can either be completely metal or made from resin with a metallic coating. The most common finishes are bronze and copper but you can also get other finishes such as stainless steel. Travertine tiles. Travertine is actually a form of limestone, it is multilayered due to it’s natural formation over many years. It can provide a sophisticated look for walls and floors and comes in a range of earthy colors. Cement bathroom tiles. These types of tiles are extremely durable. They are created by mixing mortar and sand. These types of tiles are non vitreous and can come with both rough and smooth finishes. we hope this has given you an idea of some of the types of bathroom tiles on the market. There are a couple of other more uncommon types but overall we feel these are the best options. For quotes on any tiling job you may require just call 01-6874853. Get your 10% your bathroom tiling today!